Day 5: How long did it take from the time your learned how to knit, to finish your first project? 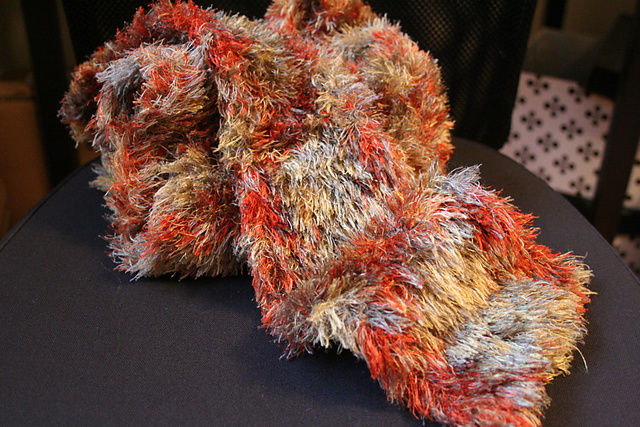 The aforementioned eyelash yarn scarf took some time if I recall. I clearly remember casting on and it was about 10 inches wide. Some time later it was 10 inches long and about 4 inches wide. Oops! I ended up frogging it, and restarting. Then I ignored it for several months, before it was picked up again and finished. So less than a year? Not merely fuzzy, but epic!